Briana Cohen, 23, Suraj Kushwaha, 22, Ana Fajardo, 25, and Mary McGowan, 29, will take Adventure Cycling educational courses, get new gear, and promote bicycle travel in their communities. 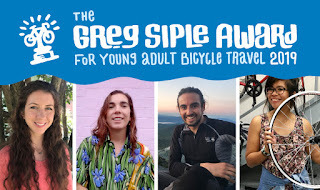 The Adventure Cycling Association recently announced the winners of the 2109 Greg Siple Award for Young Adult Bicycle Travel. The Greg Siple Award covers the cost of attending an Adventure Cycling education course and provides the winners with bike touring gear. In return, each recipient will perform an outreach project in their community to promote bicycle touring. Applicants proposed their projects in written applications, and 10 finalists in each award category were asked to make short videos about their projects. Now in its sixth year, the Greg Siple Award was developed to introduce more young people to bicycle travel. The award is named in honor of Adventure Cycling’s co-founder and longtime art director Greg Siple (also co-founder of the Tour of the Scioto River Valley - TOSRV), who discovered bike touring as a young adult and inspired generations of people to travel by bike. Click here to read more information about the award and this year's four recipients, plus watch their four winning application videos. Watch later this year for information about how you or somebody you know can apply for the 2020 Greg Siple Awards.